So how should we spend our time on Earth? 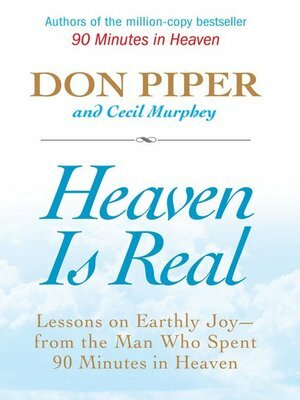 Don Piper, the Minister of Hope who spent 90 minutes in Heaven, brings us God's message. Hope for the here and now from the multimillion-selling author of 90 Minutes in Heaven. Millions believe in Heaven. Don Piper's been there. He was pronounced dead after a car accident on January 18, 1989. Ninety minutes later, Piper came back to life with an extraordinary story. His 90 Minutes in Heaven has strengthened the faith of countless people. When Piper returned to this life, he had a long road back to health, dealing with painful treatments and physical disabilities-the "new normal," as Piper calls it. Still, he had been transformed spiritually and this allowed him not only to cope with his suffering, but to transcend it. Piper found purpose in his pain, he found the message in the mess, and so can anyone else who embraces God's grace in the here and now-as well as the Hereafter. Don Piper did not return from Heaven alone-he brought the gift of hope back with him. Those who read Heaven Is Real can use what he learned to live the lives God has called them to live.